There are many applications that include hazardous materials that are capable of igniting for a variety of reasons. The safety factor requires that the surroundings, be it a chemical formulation room or the weighing scale in use, be explosion proof. As a non-contributing agent in a combustible scenario, Arlyn Guard F Floor Scales are a true measure of safety.Industries that handle materials such as agrichemicals, fertilizers, petrochemicals, solvents, gas derived products, pesticides, paint products, anti-sap stain chemicals, battery components, gun powder, metal treatment materials and the components for hydrocarbon production are apt to be susceptible from a single spark from the surrounding equipment. It is for this reason that we at Arlyn Scales have engineered the perfect specimen that translates to the safety for many aspects of the industrial manufacturing process. Our Guard F Floor Scales are Intrinsically Safe making them appropriate weighing devices for dangerous and highly explosive environments. The operating system of these explosive proof scales is based upon the highest electronic standards. The load cells that we fabricate in our Long Island warehouse are of the highest grade of stainless steel. We place our four equal load cells into machine pocketed housing in the scale’s durable and rugged frame. There is no need for a summation board in expertly engineered Floor Scales, which means that are no moving parts and this ultimately adds years of useful life to the scale.Our platforms are offered in diamond-plated surfaces to eliminate slippage. We carefully galvanize our platforms with an epoxy coating to protect against corrosion. Our standard sized platforms and weighing capacities cover most applications. The twenty five hundred pound capacity with half a pound resolution has been designed with a three-foot by three-foot sized platform. Our five thousand pound capacity scale with one-pound resolution is offered in either a four foot by four foot or a five-foot by five foot sized platform. Additionally, we offer the four-foot by four-foot sized platform in a stainless steel model. 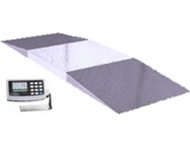 For extremely large weighing loads, we manufacture this floor scale in ten thousand capacities with a two-pound resolution with either a four-foot by four-foot or five-foot by seven-foot sized platform. For the heaviest loads, we offer a twenty thousand pound capacity scale with a five-pound resolution in a super sized platform, six-foot by eight-foot. Almost any custom size and capacity can also be ordered.Low Power Requirement In order to maintain the high level of safety, we designed these scales to operate with one 3800mah NiMH C cell battery. One battery comes with the scale and for an added benefit, we offer a recharger with two spare batteries. For complete safety, it is required to recharge and change batteries in a safe area. For complete ease of operation, we provide ramps to suit each size platform for a small additional charge. Between the low profile of the scale and the additional ramps, ease of placement and removal of weighing items is an added plus.Our included large LCD digital scale indicator is equally user friendly and highly efficient. It is operated with a nine digit keypad that enables automatic and keyboard tare, four hundred and fifty memory locations and multiple unit conversions such as pounds, kilograms and ounces. With the large one-inch digital display and a swivel mount, this indicator is easy to read in dimly lit areas. The indicator is sized eight inches high by eight inches wide by two and a half inches thick to contribute to the ease of operation. The display of the weight is adjustable to read in a tenth of a second to six seconds. Carrying forth with the tradition of including available options geared towards specific industries, we include a parts counting option that simplifies the weighing process. We provide an infrared communication interface option with an analog output known as RS-232 protocol. This state of the art protocol allows for transfer of data from the scale to a computer or workstation. The bidirectional interface allows for commands to be issued to the scale, which translates to remote operational capability.Working in tandem with this protocol, our Remote Indicator Software provides the ability to output complex printer labels. To get the best possible accurate and precise weight readings, it is advisable to select with the right fit in mind. The right fit correlates to the capacity of the scale. Choose a Guard F Floor Scale with a capacity that matches your highest possible weighing load. Choosing scales outside of your average weight loads will result in less accurate readings. Cost savings is a built in feature with an Arlyn Scale. We have been manufacturing our own sub-assemblies and scales for over thirty years from our New York based factories. As there are no middlemen involved, we are able to pass the savings on to our customers. You can be certain of finding exactly what you require for your specific application at the best price for the best quality.In the event that your application requires other dimensions and material composition, we offer customized Guard F Floor scales to suit the details of your requirements. We can adjust the platform sizes, the capacity and utilize steel, stainless steel or aluminum to suit your intended application. Our design team is at the ready to accommodate all customized orders and to deliver a custom explosion proof floor scale with a short turn around, expediently manufactured and delivered door to door. Contact Arlyn Scales for more information through our convenient online form or by calling us at (800) 645-4301.